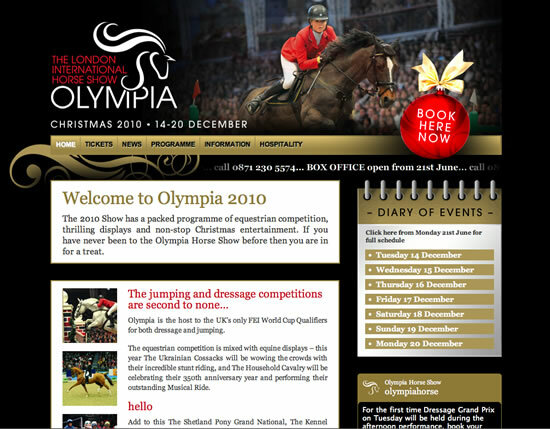 I was asked to convert the Olympia Horse Show website from a completely static site to allowing the client to be able to edit some of the page content using WordPress as a CMS (Content Management System). To for fill some of the project requirements I selected a couple of WordPress plugins which provide some useful functionality. Then I converted the xhtml/css templates I was supplied with into a custom WordPress theme with a number of different page templates. One interesting aspect of this project is that I had to develop a couple of bespoke PHP scripts for the diary widget. The widget needed to display content stored in WordPress on the WordPress generated pages as well as in non WordPress pages elsewhere in the website. So now the client can edit the website content they want to by logging in to WordPress and using it as a CMS.